A while back, we told you about Organ Trail, a zombie-filled webgame inspired by that classic work of morbid edutainment, Oregon Trail. Now the Organ Trail producers are expanding the original game and making it available on your computer and phone. The Men Who Wear Many Hats, who created the original Flash game, are currently running a Kickstarter to raise money for Organ Trail: Director's Cut. 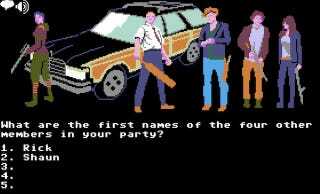 Like the "original" Organ Trail, the director's cut will trace your escape across the country as you flee hordes of zombies in a station wagon. It will also include expanded gameplay and an entirely new soundtrack. The plan is to release the game for Mac, PC, iPhone, and Android devices. The Men Who Wear Many Hats have exceeded their original $3000 goal a few times over, but pledging is a great way to pre-order the game, as well as support game designers who are working on their passion project. In the meantime, you can still play the original web game online.